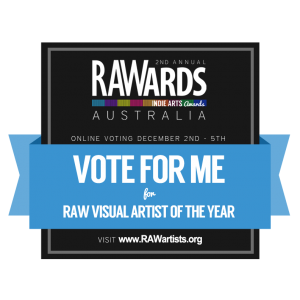 RAWards Australia 2013 is here and online voting starts at 12:01am on Monday, 2nd December and finishes at 11:59 on Thursday, 5th December. This is your chance to help me and contribute to my creative career. You can vote for me everyday til the end, to do follow the instructions below! After you’ve registered, you can go here to vote. You have one vote per category each day during the voting period. Voting starts on Monday, 2nd December at 12:01am and finishes on Thursday 5th, December at 11:59pm.